A 1950s Kirby comic strip unearthed! Posted 21 August 2012 in General. 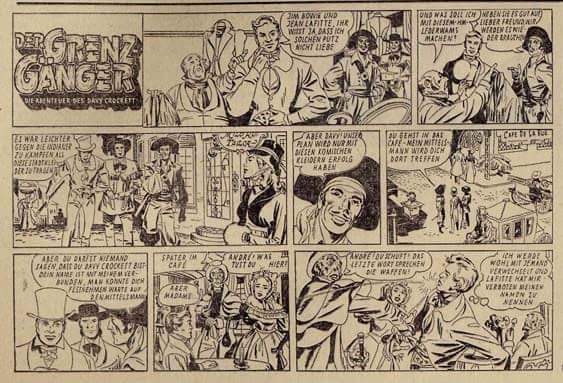 A two week run on the “Davy Crockett, Frontiersman” daily strip was recently discovered in a French digest. As strange as it seems, our discovery was not made in the USA, but in France! And the info arose from two Kirby-related investigations. First, Strange comic magazine, which I hope readers are familiar with as Strange has published many Kirby-related subjects and rarities, was gathering a French Kirby checklist. This checklist isn’t as huge as the American one, but it is quite big nonetheless! So, with publisher Reed Man and a couple of contributors (including Jean-Michel Ferragatti, François Soulodre and Dominik Vallet), we had been searching for Kirby art in the enormous number of comic magazines that had come out in France since the end of World War Two. Quite a task! But we expected that even if we made interesting finds, none would surprise the American Kirby followers. The second event leading to the discovery was the release of the documentary film, “Marvel 14: Superheroes Vs. Censorship”, which Philippe Roure and I directed, explaining why Marvel comics were banned by Communists and Catholics in France in the early 1970s.The film features Kirby by analysing Marvel’s successful style. Philippe and I were attending L’Etrange Festival, a famous movie festival where the film had been scheduled to be screened. The producers of the festival also invited the people interviewed for the documentary, so our friend Bernard Joubert, a noted comics historian and editor, was present at the show. Original art for page one of “The Legend of Davy Crockett and the Missing Bullet Hole” Western Tales 31, October 1955. Scan from the Kirby Museum’s Original Art Digital Archive, courtesy of Vince Oliva. published by Jeunesse et Vacances. House ad announcing McArdle & Herron’s “Davy Crockett, Frontiersman”, from the Spokane Daily Chronicle, courtesy of Rodrigo Baeza’s blog entry. “Davy Crockett, Frontiersman” by Jim McArdle was syndicated by Columbia Features Inc., with writing by France “Ed” Herron. 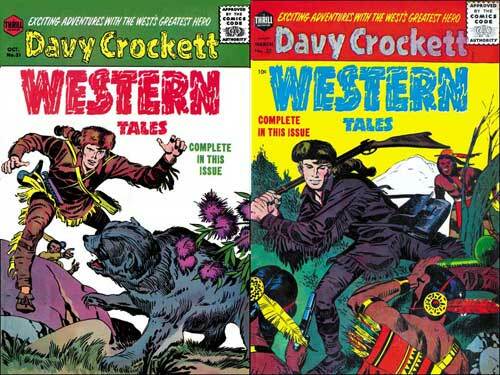 “Davy Crockett, Frontiersman” started as a daily strip in early 1955, right in the middle of the Davy Crockett craze. In fact, it premiered the same time as Harvey’s Western Tales. Presumably it was cancelled in 1959, even though it is said to have been available from Columbia up to 1972. Ed Herron and Kirby were friends since their 1939 tenure at Fox. Herron, who Kirby credited as a co-creator of the Red Skull, was writing for National (DC) as well as the “Crockett” strip in 1957. Kirby started working at National again right after the 1957 Atlas Implosion. Perhaps Herron and Kirby reacquainted themselves at National around then, which fostered Kirby getting the “Davy Crockett” strip assignment. 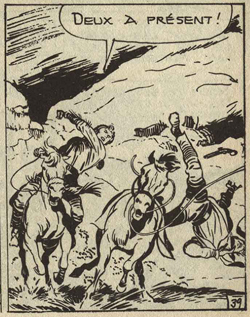 Kirby was a trained artist in the genre, having already produced several westerns (“Wilton of the West”, “Lone Rider”, “Western Love”, “Boys’ Ranch”, “Bullseye”), not to mention his recent work on “Davy Crockett” in Harvey’s Western Tales comic book. Jack had also already worked for syndicates (Lincoln, Associated Features Syndicate, Fox) and knew how to handle daily strips. To sum up, starting in January 1957, Jack Kirby “ghosted” the “Davy Crockett, Frontiersman” daily strip for less than three weeks. He started on a single strip on Thursday, 10 January—probably as a try-out—and went back to it for a 18 day tenure, from Monday, 14 January up to Saturday, 2 February. No evidence points to Kirby working on the larger Sunday strips. He inked the whole run, except the last three strips, which seem to be delineated by Roz. 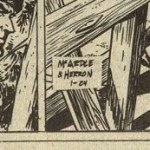 The strips Kirby worked on were not signed by Kirby, nor Herron, nor McArdle. When Jack left the assignment early February, the art was taken over by Jim Christiansen on the Monday, 4 February strip, who eventually signed it with Herron. A few months later, Herron and Christiansen dropped the Davy Crockett strip for another Columbia Features Inc. property: the detective Nero Wolfe, whose daily strips and Sunday pages they produced between fall 1957 – early 1958. Kirby and Herron would later work together on The Challengers Of the Unknown for National. So here are some previously unknown Kirby pieces from the late Fifties. 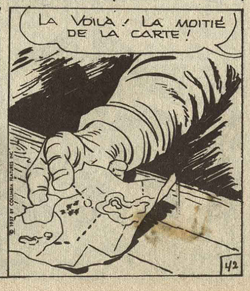 Even though it has been terribly mistreated by touch ups for the French magazine, it is still pure Kirby, inked by himself. 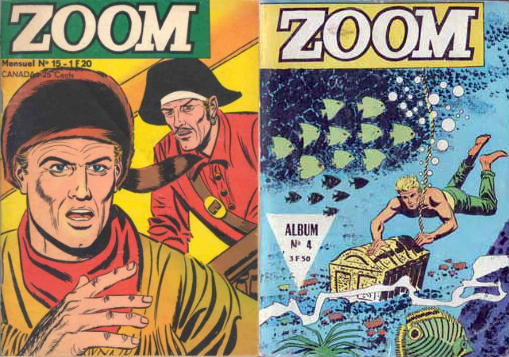 Now it is up to American collectors to track down unaltered strips, so that we can rediscover them in all their glory! Editor’s note: The above is a re-worked translation of the article Jean posted on bdzoom.com this past March. 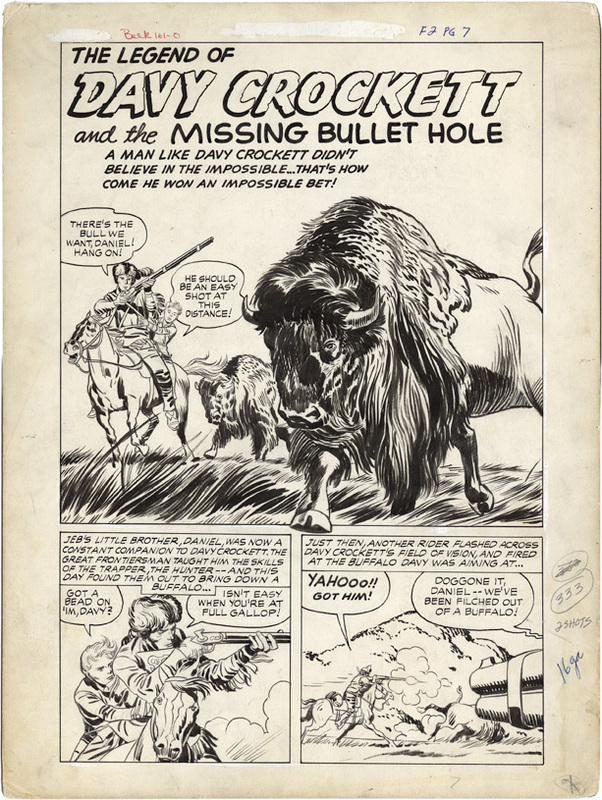 I first became aware of this Kirby Davy Crockett work through collector and scholar Tom Morehouse almost a year ago (August 2011), when I scanned the Crockett pages and the cover of Tom’s copy of Marvelman 230 (L Miller, 1958) for future reference. Tom and I thought, as Jean originally did, that it was unpublished work for Harvey’s Western Tales. 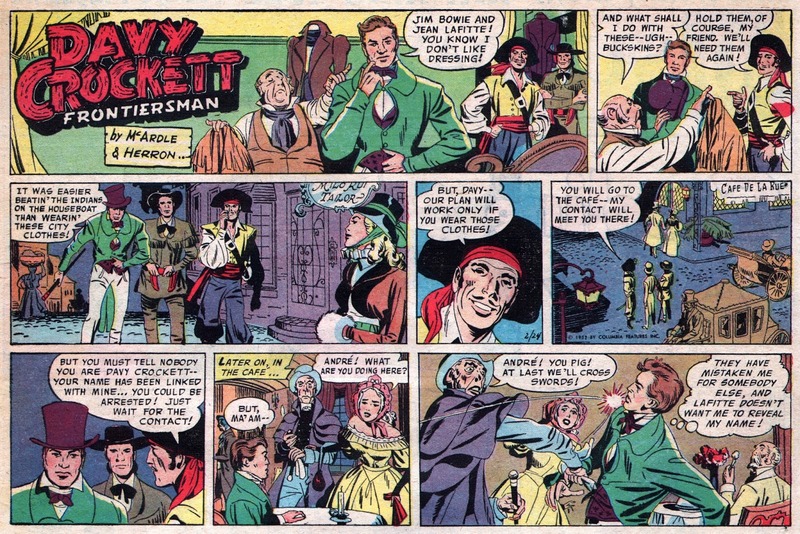 In July, there was further discussion of this work by a number of people on Comics.org’s GCD-Chat discussion group, where it was pointed out that in 2002 Matthew Gore discovered and posted Kirby Davy Crockett work from Marvelman 231. Rodrigo Baeza posted about it on his blog in July. Jean and Bernard really cracked the case by sourcing it back to the daily “Davy Crockett, Frontiersman” strip syndicated by Columbia Features. As Jean ends his article above, let’s hope that unaltered US strips can be found. I love this! New old Kirby discovered, and from across the Atlantic too! Thanks, Charles! Be reading you in the Kirby Collector. I was contacted in December 2015 by German comics researcher Hans Kiesl, who, with the help of Armin Kranz, sent along a scan (above) of a Sunday Crockett strip by Kirby in German. Hans pointed out that Allan Holtz notes Kirby ghosted two Sundays, 24 February and 3 March 1957. AND — yesterday, 23 January 2018, Dr. Michael Vassallo posted on Facebook and his blog his discovery of the 24 February 1957 Sunday in the New York Daily News. Mark Evanier pointed me to the Billy Ireland Cartoon Library & Museum, where I found a listing of the Kirby Sunday strips in the San Francisco Academy of Comic Art Collection. So, I suspect, that either through the help of the fine folks in Ohio, or through a connection Doc V. mentioned on Facebook, we’ll see the 3 March Sunday soon!